Nodosaurus was a massive herbivore (plant-eater) that lived Cretaceous period (between about 110 and 100 million years ago) in North America. Nodosaurus was one of the earliest armored dinosaurs discovered in North America: Two incomplete fossil skeletons (both missing the skull) of the animal were found in Kansas and Wyoming in the 19th century. The name, which means "knobbed lizard", was chosen by Othniel C. Marsh in 1889. Nodosaurus was entirely herbivorous (plant-eating). It had a narrow head and small teeth, and would probably have struggled to chew fibrous plants - suggesting that either it ate only soft plants, or that its stomach may have been equipped with gastroliths (stones swallowed to help digestion) for mashing up plant material. Nodosaurus was about 13 to 20 feet (4.0 to 6.1 meters) long, and weighed around 1 ton. It was protected from predators by bony plates in its skin, and may also have had spikes as well. 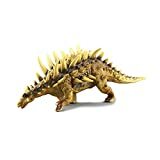 However, unlike some of its armored relatives such as Ankylosaurus, Nodosaurus was not equipped with a club in its tail - so its defense seems to have been entirely passive - when attacked, it probably lowered itself to the ground, hiding behind its protective features, much like a modern day hedgehog. North American Dinosaurs - Nodosaurus lived in North America. Nodosaurus was a genus of dinosaur. Nodosaurus was a member of the Ornithischia ("bird-hipped") order of dinosaurs. What this means, is that although Nodosaurus was not closely related to birds, it did have similarly shaped pelvic bones. Nodosaurus lived between about 110 million years ago and 100 million years ago, during the Cretaceous period. Nodosaurus lived in North America. Nodosaurus was a herbivore (plant-eater). Nodosaurus was about 13 to 20 feet (4.0 to 6.1 meters) long. Nodosaurus weighed about 1 ton. The lifelike dinosaur will be a great Gift idea. Size: 9.3"x2.8"x3.1"
Well-designed dinosaur series, better to have all varities. Get kids the dinosaur toys as birthday presents, holiday gifts or study incentives. The Jurassic World is here for you.Set foots on the journey of adventure!You will enter a world which you have never been to.Have fun with kids! The dinosaurs flourished in the 230 million years ago. But Dinosaurs suddenly disappeared in 65 million years ago by the end of the Cretaceous. Still a mystery in the history of the evolution of the earth, this mystery is still no conclusion. Dinosaurs only remain in fossils. In the Mesozoic strata, many dinosaur fossils have been found. Which can be seen in a large number of or a variety of shapes of the bones. Dinosaurs, and body shape and habits are also large differences, there are meek herbivorous and violent meat eaters. 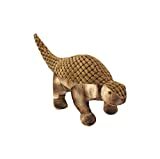 These realistic models of dinosaur toys based on today's high-tech archaeological research. Take you back to the ancient world, have a glimpse of the appearance of dinosaurs. If you wish this as a Gift,please mention the Estimated Delivery Date above . DINO DREAM: This scaly brown beauty is a Nodosaurus, an herbivore who is perfect to add to any dinosaur lovers collection. Guaranteed to not become extinct. COMFORT: This plush is a comforting pal and perfect for get well wishes, birthdays and more! It is a huggable travel friend for any child on road trips & airplanes, or a cute bedroom decoration. HIGH QUALITY PLUSH ANIMALS: Whether for a child's playtime, comfort at bedtime for sleeping & or a keepsake to hold dear while far from home, Wishpets offer you their soft & cuddly best. Wishpets are high quality, plush stuffed animals made with luxurious softness and huggable cuteness. We design a diverse line of realistic and whimsical as well as traditional stuffed toys that are sure to delight no matter the occasion. Choose a new Wishpet or two to take home today.